Protect Your Smile – Get a Free Mouthguard When You Get Braces in Bethel Park! Most people aren’t aware that they need to wear a mouthguard while they’re in braces. But it’s actually even more important than usual to protect your teeth and gums during orthodontic treatment! After all, you don’t want to spend time and effort to straighten your smile, only to knock out a tooth or sustain another injury. At Cartwright Orthodontics, we’re so convinced of the value of a mouthguard that we provide one at no charge for every patient when they get braces in Bethel Park. Find out more below about how mouthguards prevent injuries and which type of mouthguard is the most effective! Why Is It So Important To Wear a Mouthguard? Whether you play a contact sport or simply enjoy recreational activities like mountain biking, it’s well worth it to safeguard your smile. In addition to preventing injuries to the teeth and gums, mouthguards have also been found to reduce the risk of head and neck injuries such as concussions. This is even more important when you’re wearing braces because your risk of injury is automatically higher. For example, in the event of a contact injury or fall, brackets and wires can easily traumatize the soft tissues like the lips and cheeks. Not to mention that braces themselves can get broken or damaged. And, in many cases, an injury disrupts treatment because braces must be removed during the healing process. Can You Use a Store Bought Mouthguard? The most effective mouthguard is one that’s custom-made by a dentist or orthodontist. Since it needs to accommodate brackets and wires, this is particularly true when you’re in braces. And, in general, over-the-counter options have significant drawbacks such as being ill-fitting, thinner, and less protective. In fact, a study from the Academy of General Dentistry found that football players who wore over-the-counter mouthguards were over two times as likely to get head injuries than those wearing a custom-fitted one. The first step in straightening your teeth is scheduling a consultation. After doing an exam and discussing your goals, we’ll create the perfect treatment plan for your needs, including a protective mouthguard at no charge. An accident or injury can happen at any time. Since braces are a fantastic investment that pays off for a lifetime, it’s well worth it to protect your smile during and after treatment! Dr. Gary Cartwright is an orthodontist with over 20 years of experience and a graduate of the University of Pittsburgh. 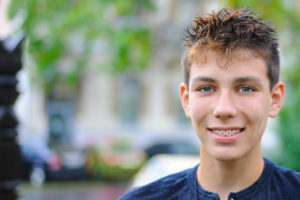 He wants to help his patients prevent oral injuries instead of having them treated, so he’s happy to provide mouthguards to all of his patients in braces. If you’re interested in braces in Bethel Park or have any questions, he can be reached via his website. Comments Off on Protect Your Smile – Get a Free Mouthguard When You Get Braces in Bethel Park!